What is an heirloom tomato? Many gardeners have heard the term but don't really know what it means. Happily, it's an easy definition: a variety that has been passed down from gardener to gardener. Unlike modern hybrid varieties, heirloom tomatoes come true from seed, making them easy to share. The main reason to choose heirloom tomato varieties is the flavor. There's no one taste; you'll find a wide range of flavors in the heirloom-tomato world. But many of these varieties are prized for having an old-time taste—they're a far cry from tomatoes at the grocery store, or even from many modern hybrids like 'Better Boy' or 'Early Girl'. Perhaps the most famous heirloom tomato, 'Brandywine' is a classic strain that many experts rank as the best-tasting tomato around. It features large red fruits—to 2 pounds each—and dates to the late 1800s. 'Brandywine' is an indeterminate variety (meaning it continues to grow after it begins producing fruit), and its fruit ripens about 85 days from transplanting. Heirloom Tomato Tip: Heirloom tomatoes aren't necessarily organic. Organic means growing plants without the aid of synthetic fertilizers, herbicides, etc. Many gardeners prefer to grow their tomatoes organically, but not all organic tomatoes are heirloom, and not all heirloom tomatoes are grown organically. 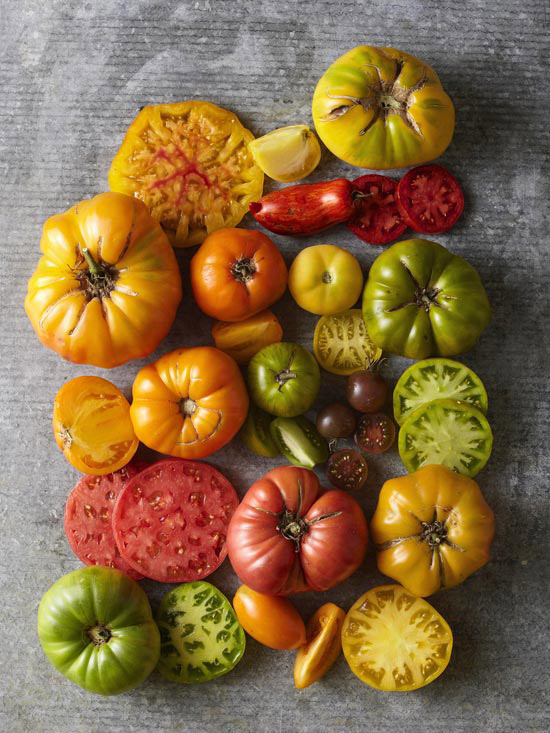 Heirloom tomatoes come in a wide variety of shapes, colors, and sizes—there's an heirloom tomato for every space. 'Gold Rush Currant' is a delightful little one that offers lots of small but very sweet yellow-orange fruits in clusters. It's an indeterminate variety, and its fruit ripens about 80 days from transplanting. Test Garden Tip: Many yellow tomatoes have a sweeter taste than their red counterparts. See how easy it is to get homemade salsa from just one container! An old variety from Cuba, 'Cuban Yellow Grape' produces fruit like you'd expect from the name: clusters of small, yellow grape-type tomatoes. It's a vigorous, indeterminate variety that grows tall and produces very sweet fruits. The fruit ripens about 90 days from transplanting. Test Garden Tip: All heirloom tomatoes grow best in a spot that has full sun (at least six to eight hours of sun per day) and moist, well-drained soil rich in organic matter such as compost . A large cherry tomato that keeps producing and producing and producing, 'Super Snow White' bears clusters of pale yellow fruits that resist cracking and are known for their exceptionally sweet flavor. It is an indeterminate variety that ripens about 75 days from transplanting. Test Garden Tip: Most heirloom tomatoes grow well in large containers, making them perfect plants to grow on a sunny deck or balcony. In fact, growing them in containers can help reduce instances of disease. A Russian heirloom, 'Galinas' produces tons of golden-yellow fruits in clusters. It's known for its productive nature, and the fruit has a very sweet flavor. An indeterminate variety, 'Galinas' can grow 6 feet tall. The fruit ripens about 75 days from transplanting. Test Garden Tip: There are two main categories of tomato growth habit: determinate and indeterminate. Determinate tomatoes stay smaller and compact because their growth slows after they begin producing fruits; indeterminate varieties keep putting on new growth after they start bearing tomatoes. Short on space? Try growing tomatoes in containers. All you need is the right soil and a sunny spot on your deck or patio. A variety from the early 1800s, 'Beam's Yellow Pear' has loads of long, pear-shape, golden-yellow fruits. Like many small-fruit tomatoes, it's perfect for snacking and has a sweet flavor. It's a vigorous, indeterminate plant, and fruits ripen about 70 days from transplanting. An award-winning tomato from 1943, 'Golden Jubilee' offers 3-inch-wide, juicy golden-yellow fruits that are quite sweet. It's an indeterminate plant, and the fruits ripen about 70 days from transplanting. Test Garden Tip: Heirloom tomatoes typically weren't bred for good disease resistance. To help your plants stay healthy, pick off affected leaves as soon as you see them. Throw the diseased foliage in the trash, not your compost bin. A big, yellow heirloom beefsteak-type tomato with fruits that can reach a pound, 'Goldie' features a sweet flavor and ripens about 90 days from transplanting. It's an indeterminate variety. Bearing 2-inch ivory-gold fruits that have a slightly fuzzy coating, 'Wapsipinicon Peach' tomato offers a wonderful sweet flavor. This 1800s Iowa heirloom variety is an indeterminate grower, and the fruits ripen about 80 days from transplanting. A grape-type tomato, 'Rosalita' features clusters of small, sweet-tasting, pinkish-red fruits in abundance. It's an indeterminate grower, and the fruits ripen about 60 days from transplanting (making it a great choice for gardeners in northern areas). Test Garden Tip: Many heirloom tomatoes are susceptible to cracking open on the vine. Avoid this problem by keeping the soil evenly moist and using an organic slow-release fertilizer. As beautiful as it is tasty, 'Speckled Roman' bears 5- to 6-inch-long paste-type red fruits that are playfully striped with orange and yellow. It's an indeterminate grower, and the fruits ripen about 85 days from transplanting. This heirloom tomato really stands out from the crowd! 'Costoluto Genovese' is an Italian heirloom that offers deep red fruits that are heavily ribbed. It's a fantastic sauce tomato with a very rich flavor. It's an indeterminate grower, and the fruits ripen about 78 days from transplanting. Known for its tolerance to cold weather, this Russian heirloom ripens early, producing 5-ounce round, red fruits about 60 days from transplanting. It has a very rich flavor, especially considering it's an early variety. 'Moskvich' tomato is an indeterminate grower. They're not actually black in color (more like dark purple-red), but 'Black Cherry' tomatoes have a complex flavor that's a little more savory (and less sweet) than the average tomato. It's a quick indeterminate grower that produces tons of fruit through the season. The fruits take about 65 days to ripen. While it's not an old-time variety, 'Green Zebra' is an open-pollinated tomato that's good for collecting and saving seeds. It's pretty distinct; the golf-ball-size fruits are gold with bold green stripes. It has a great flavor and is often ranked as one of the top-tasting heirlooms. 'Green Zebra' is an indeterminate variety, and the fruits ripen 80 days from transplanting.